Learn to draw 20 awesomely athletic characters! 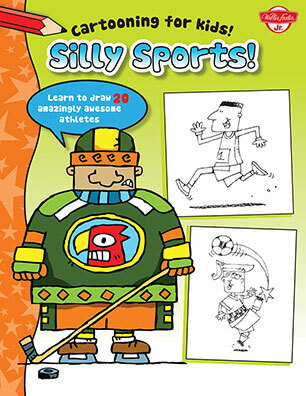 Silly Sports teaches young cartoonists to draw a range of sporty characters in true cartooning style. Silly Sports teaches young cartoonists to draw a range of sporty characters in true cartooning style. Children will love drawing quirky athletic characters in action, as well as learning how to draw and write their own original cartoons. Featured sections cover silly expressions and awesome accessories that will make your cartoon creations extra wacky. Projects include favorite sports, including football, soccer, baseball, hockey, and more. Each lesson begins with a simple shape and progresses to a colorful final piece of art, making it easy for budding artists of all skill levels to follow along. Silly Sports teaches young artists-in-training how to take their drawing skills from enthusiastic doodler to ace cartoonist through a series of engaging, easy-to-follow step-by-step cartooning projects. Along the way, tips and tricks from a professional cartoonist are included to guide their storytelling efforts, making this book an experience that is sure to create a new favorite pastime. Dave Garbot is an experienced illustrator who enjoys working with clients to create fun and engaging images for a variety of projects. Relying on his whimsical imagination, humor, and attention to detail, Dave is often called upon for assignments in children's publishing, advertising, character development, stylish lettering, games, and fun maps. His list of clientele includes Barnes & Noble, Harper Collins, Penguin Press, Scholastic, Klutz Press, Sterling Publishing, Addison Wesley, Parenting Press, Carrabba's Restaurants, Hyatt Hotels, McDonald's, the Tribeca Film Festival, and Arnold Worldwide. A native of Portland, Oregon, Dave currently resides and works in Beaverton, Oregon.